Hi all, jen t. here. Ready for some more wobbley fun?! I am stopping by today to share a birthday card i made using My Mind's Eye Hootenanny papers and of course an action-wobble . I cut a card from white cardstock on my cricut weaved american crafts ribbon thru the holes ,then cut out and layered the happy birthday. 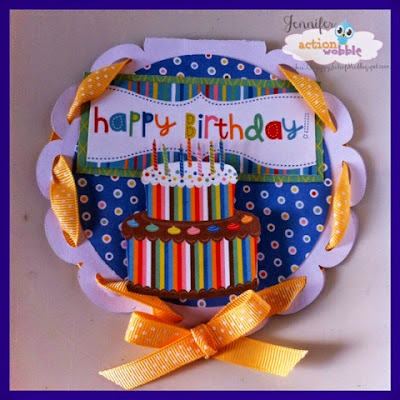 I fussy cut the birthday cake from the patterned paper and added a wobble to the back. Thanks for stopping by and happy creating! 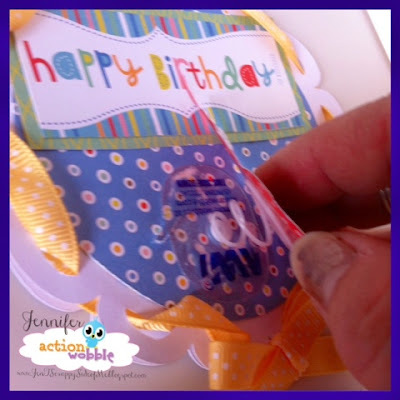 Jen t.
Labels: Birthday Card, Jen t.